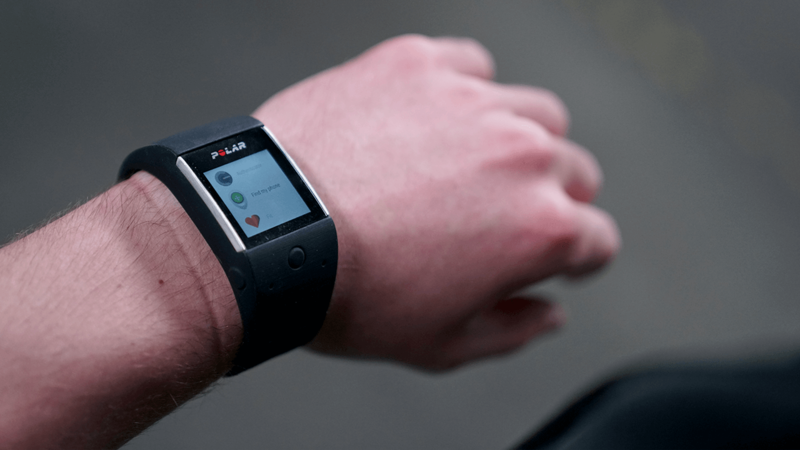 The M600 is Polar’s first Android Wear device, but make no mistake — this is no smartwatch. With built-in GPS, a host of training features, and improved heart rate technology, the M600 stakes its claim as one of the best running watches on the market. The only real debate with this watch hinges on price. Is the M600 really worth $329.95? Here’s everything you need to know before making your decision. With its running program, various sports profiles, and smart coaching, training is one area where Polar really stands out. The M600 offers similar functionality as the Polar A360 and the M400, but why change what already works? The M600 is a high-level running watch, but some of the best feedback it provides doesn’t necessarily revolve around running. Take training load, for instance. 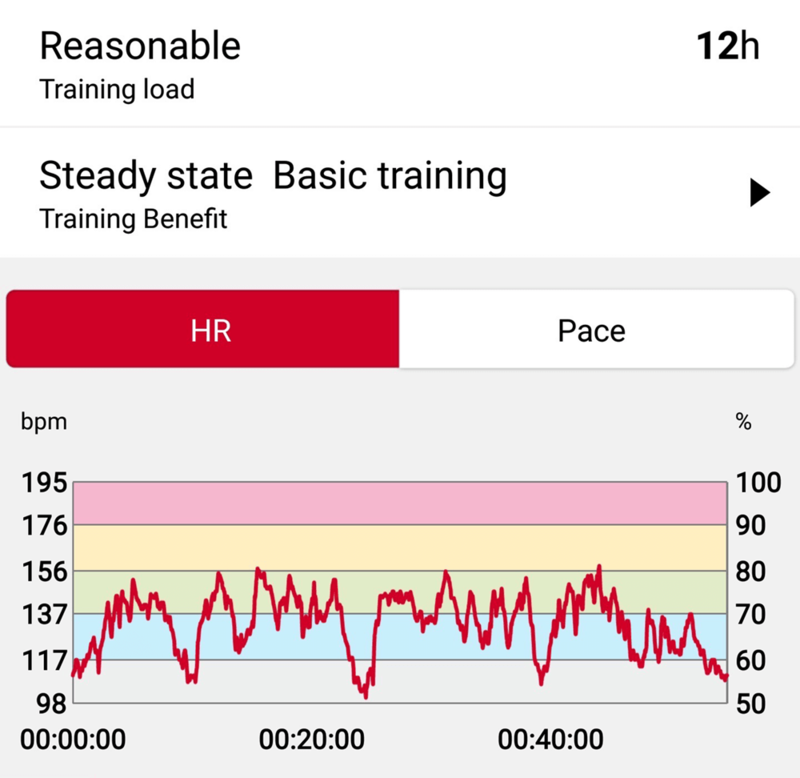 This feature measures how strenuous a workout is based on its duration and intensity, and the Polar Flow app lets you compare these results across multiple sessions. 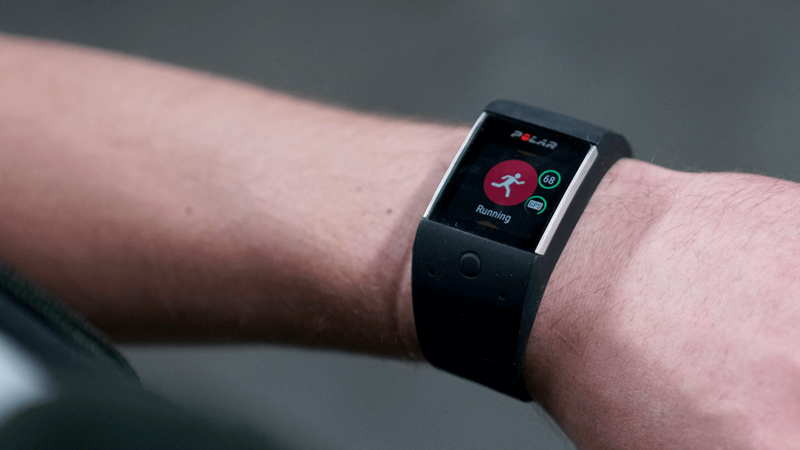 The watch also estimates how much recovery time you need after each activity. GPS tracking on the M600 is highly intuitive. 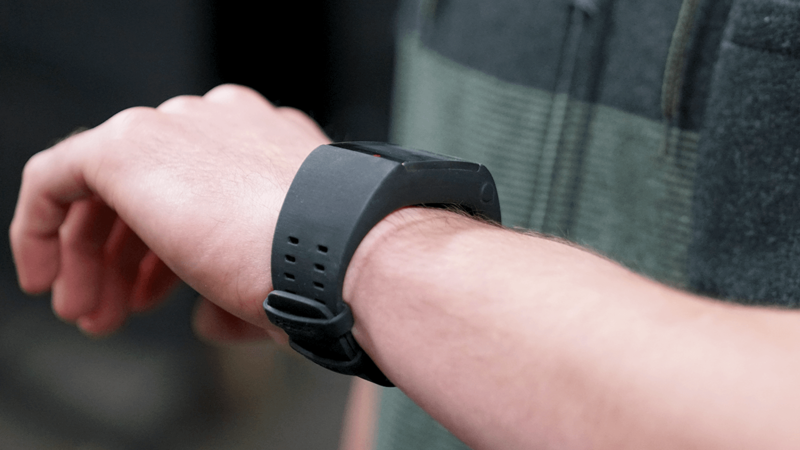 The device actually knows which workouts require GPS, so it doesn’t start tracking your location (and draining battery) until you scroll over an activity like cycling or running within Polar Flow. When GPS was enabled, the M600 routinely tracked my position within 10-15 seconds. The watch vibrates twice and the green circle stops rotating when your location has been found. Really, the only downside to the M600 was that it doesn’t have automatic exercise detection. 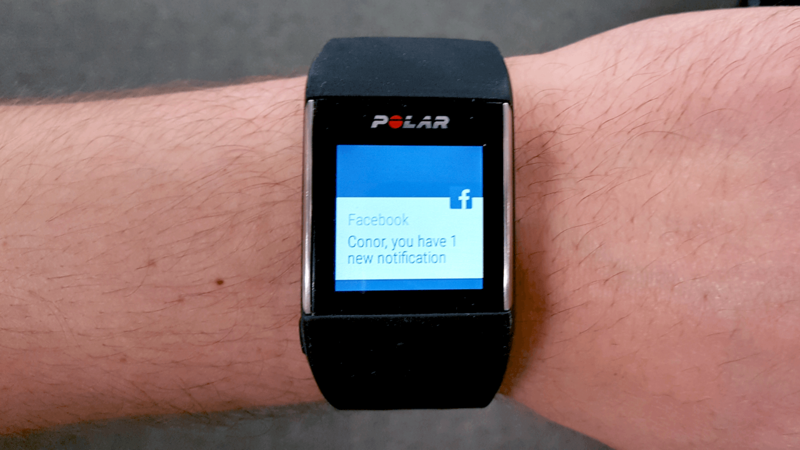 Users still have to manually select which workout they want in Polar Flow, or else the device won’t save any data. 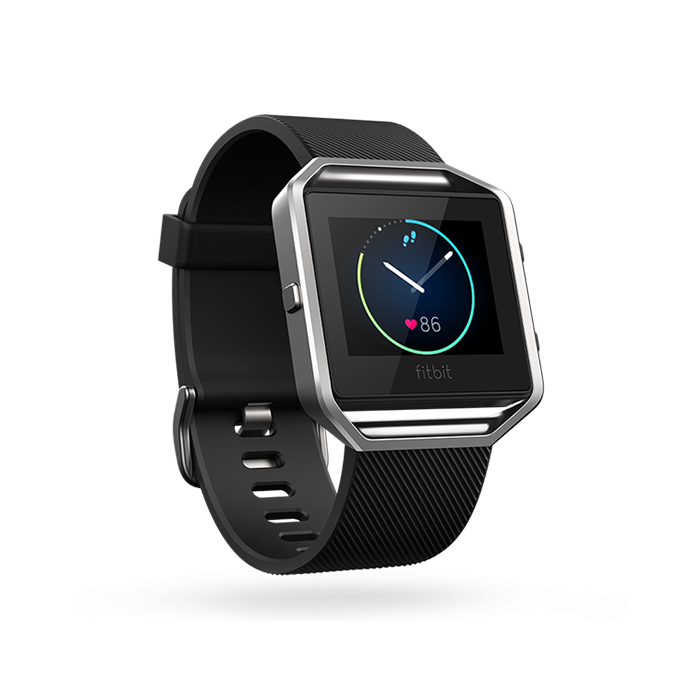 A comparable device like the Fitbit Blaze recognizes an activity like walking or basketball pretty quickly. One of my biggest issues with the Polar A360 was the inconsistent heart rate readings it provided at high intensity. I compared the M600 against the Suunto Sports Tracker Smart Sensor to see how much the company’s optical heart rate tech has improved. In all of my testing runs, the heart rate data from the two devices lined up very closely. The M600’s average bpm was typically within five 10 beats of the Suunto chest strap, while the maximum heart rate measurements were usually within two to five beats of each other. These numbers are a huge improvement over the A360. Related: Does PAI technology make the Mio Slice a worthy investment? Activity tracking is available through Google Fit and Polar Flow, but the latter is still your best option on the M600. Not much has changed from previous Polar models — stats are available on the device through the My Day icon, while the app is setup exactly the same. The only real change I noticed was that on-the-spot heart rate readings are no longer available in Polar Flow. The app still provides a really great summary of your activity, including active time, activity intensity, and statistical breakdowns over time. 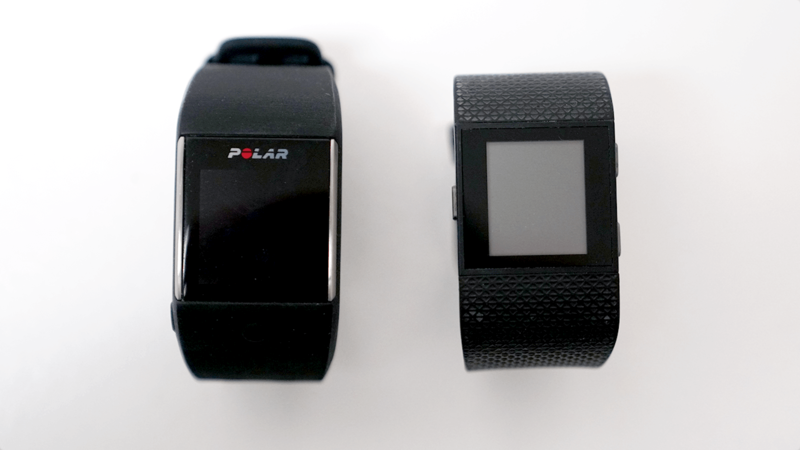 Unfortunately, Polar’s sleep tracking hasn’t evolved much. The watch tracks restful sleep, restless sleep, and total sleep, but there aren’t any details beyond that. Other fitness watches like the Withings Steel HR provide a much better representation of nightly activity by tracking your heart rate and sleep cycles. 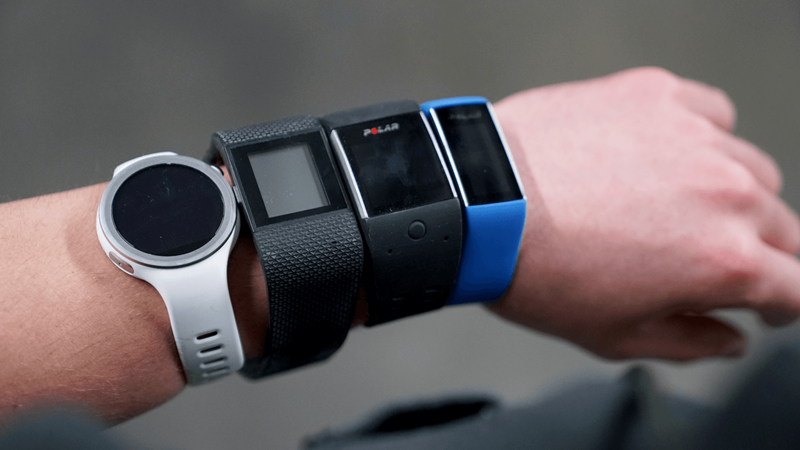 At first glance, the M600 reminded me of the Fitbit Surge, which is about the worst comparison I can make. Once I put the watch on, however, those similarities quickly faded. While both of the devices look a bit rigid, Polar’s latest fitness watch has more curved edges, doesn’t feel as blocky, and is infinitely more comfortable. The M600’s color touchscreen also gives it a significant edge in looks over its Fitbit counterpart. Polar actually improves on elements of the A360 and the M400 to produce its best display yet on the M600. It features a 1.3-inch display and 240x240 screen resolution. There is a front-facing button — which immediately activates Polar Flow — just below the screen and another button on the side, but I used these more during training than for actual navigation. That’s because the M600’s display is fully touchscreen-enabled, unlike the A360. Tapping the screen will immediately wake it up, even when the always-on screen setting is off. The M600 joins a growing list of Polar products with impressive water-resistance. 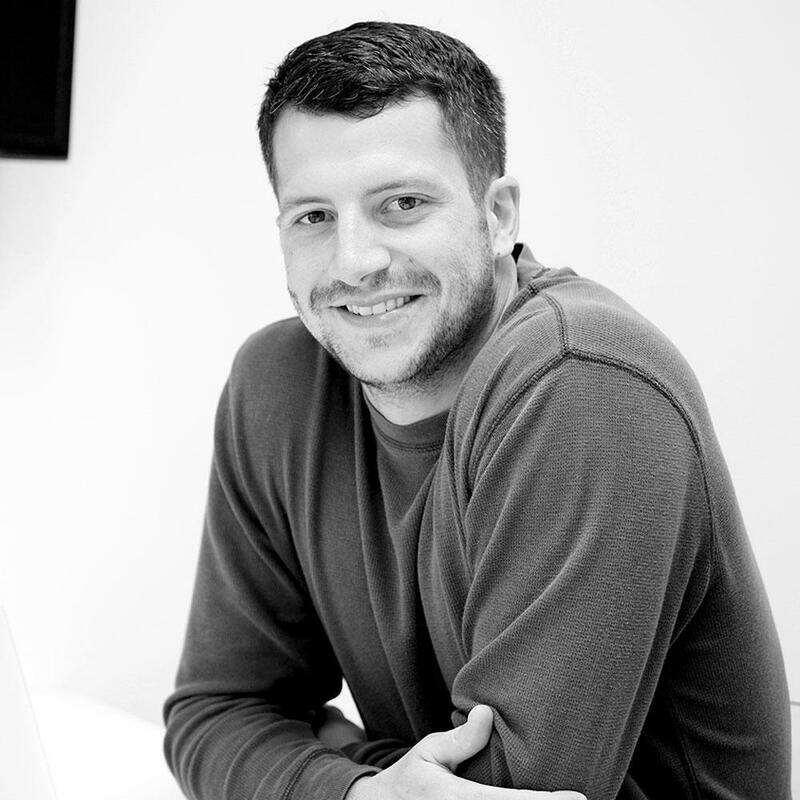 The watch has an IPX8 rating, which means it’s suitable for both showering and swimming. Most color touchscreen devices don’t offer water protection beyond sweat or splashes. Polar will take advantage of the M600’s water-resistance in the near future with new swimming features. Users will be able to track advanced metrics like distance, pace, strokes per minute, and strokes per pool length at some point this spring, according to a company press release. The M600 will also be able to determine which stroke you’re using with this updated functionality. The wristband was my only real sticking point within the M600’s design. While the silicone looks sporty and feels comfortable, the thickness of the strap presented a few problems during my testing period. At different times throughout the night, the wristband would catch on my pillows or drag the sheets a bit as I tried to change positions. I had similar issues whenever I stretched or played a sport that required a lot of wrist engagement. 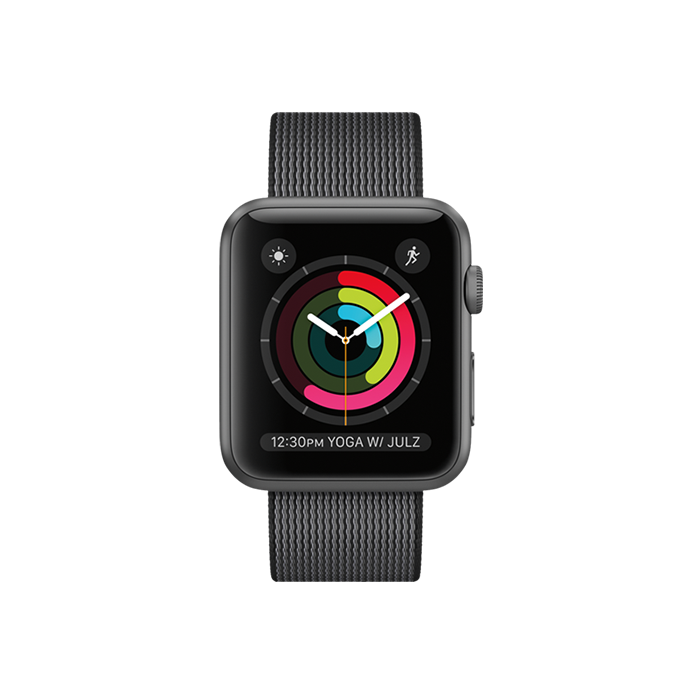 Because the strap thickens considerably around the display, the watch had a tendency to grab onto things that came in contact with my wrist. Extra loops helped keep the clasping system secure, but the chunkiness of the strap contributes significantly to the watch’s weight (63g). Much like the Moto 360 Sport, the M600 attracted quite a bit of fluff. These particles were probably more noticeable on the black model that I tested, but it’s something to keep in mind nonetheless. While the inclusion of Android Wear makes the M600 an appealing hybrid option, this shouldn’t be one of the device’s main selling points. Let me clarify — this isn’t because I dislike Google’s OS (I’m a fan). Rather, it’s because many of the Android Wear features go relatively unnoticed on the M600. In other words, you don’t need smartwatch functionality to enjoy this device. Sure, Google Fit, Google Voice, and countless other apps were available to download and use, but I really didn’t use them. 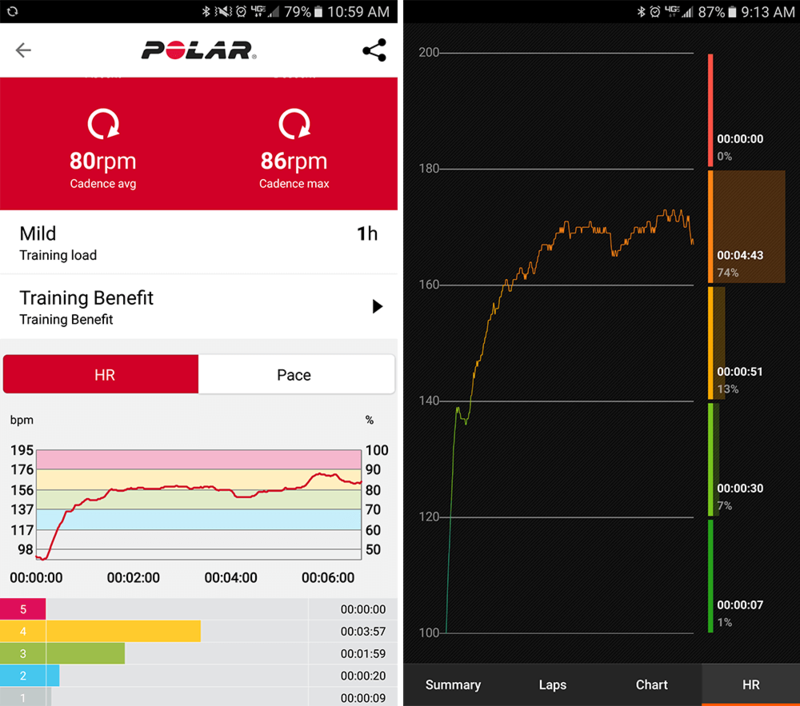 Along with the Polar Flow app, the M600 provided all of the features that I wanted from a fitness watch on its own. This could all change when the M600 updates to Android Wear 2.0 this spring, but for now, I’ll stick to the biggest change I noticed over other Polar devices — usability. All of the syncing issues I had with the A360? You won’t find them on the M600. Not only did Bluetooth connectivity seem much stronger on the M600, but I never had to manually sync any data to or from the watch. That improved connectivity translated to notifications as well. Similar to the Samsung Gear Fit 2, the M600 delivered the notification support that you’d expect from a smartwatch. The device registered multiple alerts in line with my phone, displayed full text messages on-screen, and also had voice-to-text available to answer messages. The watch even previewed pictures from some social media posts. 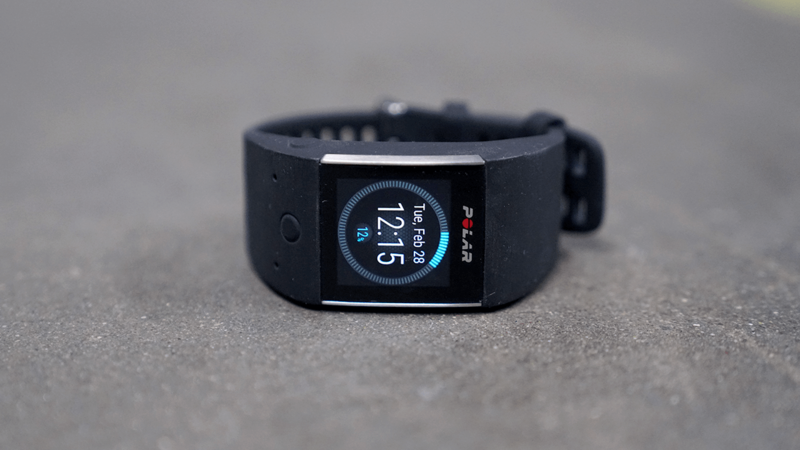 In terms of battery life, the M600 falls somewhere in the middle tier of GPS fitness watches. The device lasted nearly eight hours in GPS mode — which is respectable — but its 500mAh battery only yielded between 2 to 2.5 days of usage overall. That usage period drops to one day if you use the M600 with an iPhone. As a reference, here’s what kind of battery life users typically receive from comparable GPS running watches on the market: the Garmin Forerunner 35 lasts up to nine days in watch mode and 13 hours in training mode, the TomTom Spark 3 can track activity for up to three weeks and works for 11 hours in GPS mode, and even the M400 lasts up to 30 days with activity tracking and eight hours in GPS mode. 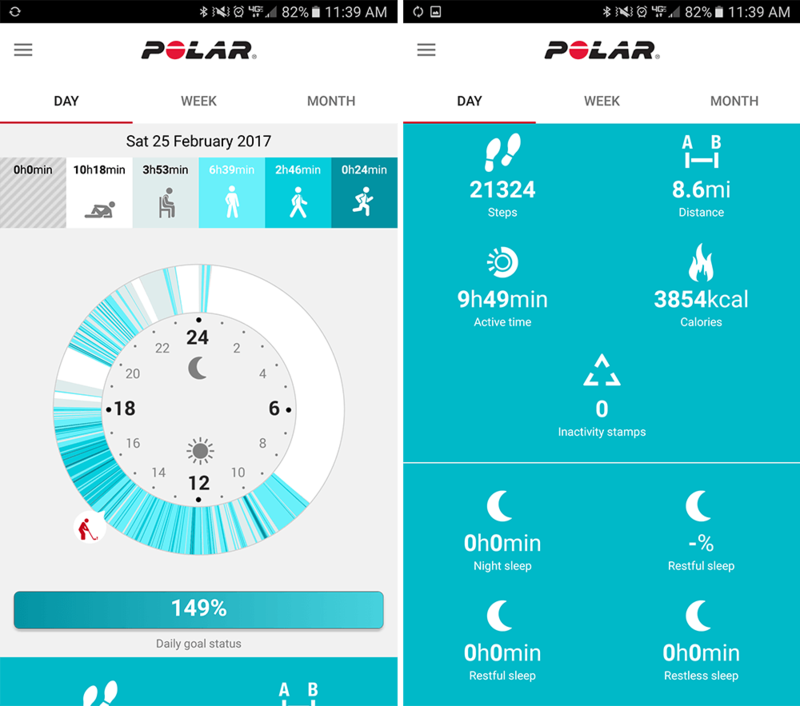 Polar A360: Worth It Or Not? When you look at the M600’s overall package of training modes, its upgraded display, and the device’s comfortable, waterproof design, it’s hard to find any glaring weaknesses. To be fair, at $329.95, there really shouldn’t be. So, the real question remains — is Polar’s best wrist-worn wearable worth the extra money you’d save with alternative running watches? With its potential as an all-day device, along with the incoming swimming and Android Wear 2.0 updates, my answer is yes. 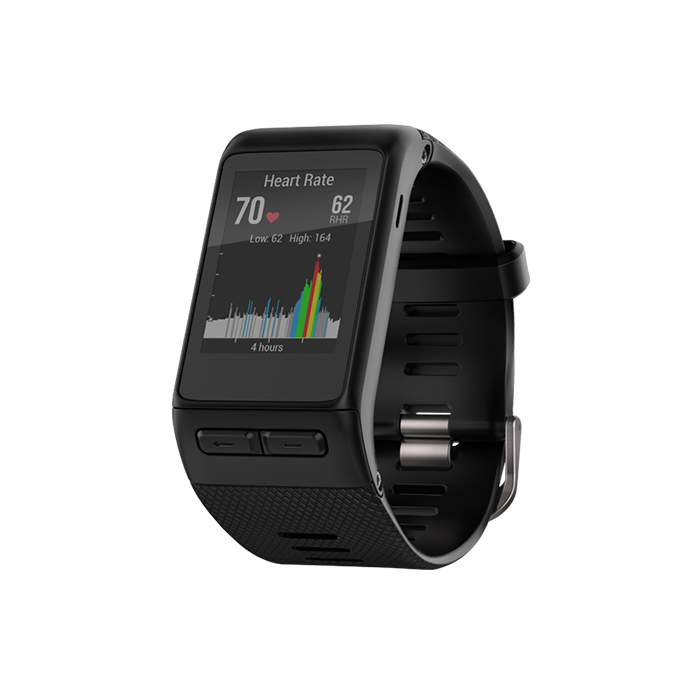 Garmin’s Vivoactive HR the perfect option for users who want a packaged deal. As eye-catching as the Apple Watch may be, it’s not the best product on the market today. Please login or sign up to vote! Please CREATE AN ACCOUNT or SIGN IN to submit your rating.